I have one week left, and I’m out of coffee. Thousands of words left to write, and I’m out of coffee. Maybe I’m being dramatic, but I don’t have time to run to the store and buy more. With a “to do” list longer than Santa’s, how can I squeeze in 20 minutes to run to the grocery store? C-O-F-F-E-E Coffee is not for me. They can’t give coffee up. In sixth grade I was determined never to become a person who needs coffee every morning. This song told me coffee was bad and I would go through withdrawals like I would with that cocaine thing we were learning about in health class. However, I do need coffee in the morning and I do not have any. I’ve been drinking tea every night before bed since high school. I love tea, tea loves me. Currently, I’m drinking Scottish Breakfast tea and it’s definitely doing it’s job of replacing coffee. However, Green Tea works best in the morning because it has slightly less caffeine than coffee, but it has amazing health benefits and you’ll never look old if you drink it. Or two. 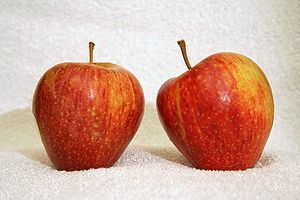 Apples have natural sugars that can wake the body up faster than a cup of Joe. These sugars last a lot longer than caffeine, too. Also, an apple a day will keep the doctor away. Vanilla flavoring, coconut water, almonds, banana, honey, and ice. Exact measurements here. This doesn’t look good, this doesn’t sound good, but it’s actually really good for you. It’s backed with vitamins, minerals, and nutrients so your body is super charged all day. 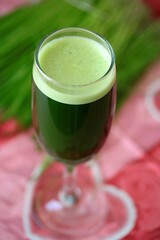 Wheatgrass juice can be drank alone or in a protein shake. They definitely sell this at Whole Foods and Trader Joe’s, but I doubt they have it at a grocery store. This is simple. Slice a lemon, put it in your water, have all day energy. Ok maybe not all day, but enough. It’s low calorie and hydrating, so your blood will be flowing happily through your veins and you’ll want to tackle the day. 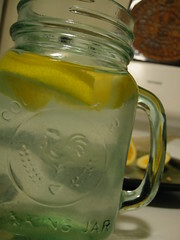 Just put the juice od=f half a lemon into your morning water and refresh your senses! This is pretty simple too. Drink a good cup or two of water in the morning and keep hydrated through the day so you’ll never really feel sluggish. 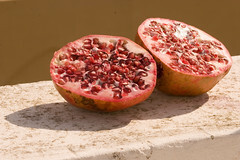 Pomegranates are sooo good for you! It’ll energize you while taking out your toxins, making you feel like Wonder Woman or Super Man. Add it to a fruit smoothie, or be daring and sip a glass on its own. Best in a smoothie, flaxseed is a super hero (I think I found a theme) in waking you up and keeping you energized. 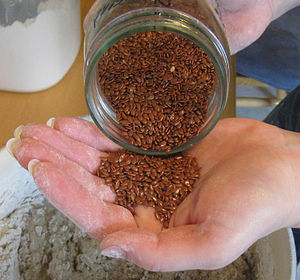 Flaxseed also comes in an oil which you can use wherever you use oils. So there you have it. 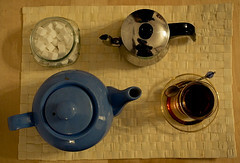 Healthy alternatives to a caffeine addiction. I’ll probably just run to the store and buy a small thing of coffee thought because I’m also out of body wash and that could turn into a huge smelly problem.